This morning I went out to look for some fennel which I needed to make a Provençal dish called ‘Poulet au Pastis’. For most part of the year there is no problem finding it – every little bit of uncultivated land will have fennel growing on it. As the winter has been quite severe, it was not easy to find fresh growth. I did manage to gather together a decent bunch after getting myself very wet and muddy ! All this gave me the idea that our readers might find it interesting to know a bit more about fennel. 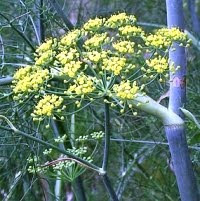 Fennel is native to the Mediterranean area and introduced to other regions of Europe. It prefers wasteland and well-drained soil in a sunny position. Fennel is one of the oldest cultivated plants and has been used for culinary and medicinal purposes for at least 2,000 years. Every part of the plant can be eaten, from the seeds to the root. The Romans had a real liking for it. It was used to keep in good health and by the women to prevent obesity. The famous emperor Charlemagne, who ruled a large part of Europe and set up herb gardens near all his residences, declared in 812 AD that fennel was essential in every imperial garden. It was one of the nine herbs held sacred by the Anglo Saxons for its power against evil. As it turns out the ancients were quite right in valuing the herb. Chewing on the seeds helps the digestive system and helps to still hunger. Drinking an extract of the seeds (simmer for 30 mins) helps against constipation, stimulates the production of breastmilk and helps to regulate the menstrual cycle. An extract of the seeds and root together helps with slimming by working as a detoxicant and diuretic. Seeds – in curries, fish sauces, bread and for sprouting for winter salads and not to forget in Pastis. Leaf – finely chopped for salads and cooked vegetables. You can add it to soups, sauces and for stuffing oily fish. Stem – young stems can be added to salads and eaten as a cooked veg. Bulb – (Florence fennel, the fennel you find in the shops), slice or grate raw into sandwiches and salads or cook as a root vegetable. Depending on the weather we can start gathering the leaves by the middle of March.